Hi, my name is Amy. I love visiting your blog because there is a peace that radiates from your family, it reminds me of the peace in my own family. That was so cheesy! Anyway, I just love the dresses you make for your girls. 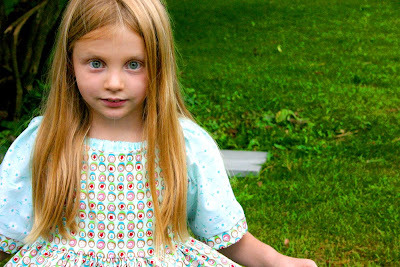 I desire to sew for my daughters too, and to teach them to sew, but I was never taught and I don't know where to begin. Any advice? Hello! I've been reading your blog for quite some time now and have really enjoyed it! 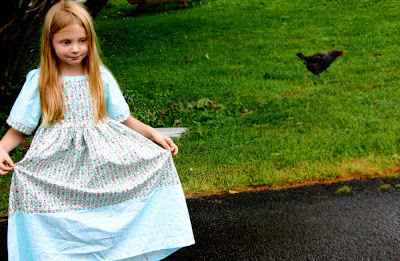 I just had to comment on the sweet dress you made for your daughter, my mom used to sew little dresses for my sister and me and now I love to sew. Just thought I'd let you know what a blessing your blog has been; I feel like we may? even live farely near each other?? Perhaps someone in your church sews who would be willing to give lessons or is there a local fabric store? Most fabric stores offer lessons or can point you in the direction of someone who could teach you. I'd also check out what sewing books your local library has available. I was lucky enough to have a Mom who sews beautifully and has passed on some of her sewing wisdom to me. Joanna, we live between Syracuse and Albany. Love this dress pattern, did you make it up or is it one you can buy? My girls would just love this!! No pattern to speak of. I used the bodice piece from a Butterick jumper pattern and simply cut the remainder of the fabric into two rectangles for the skirt, adding that panel at the bottom. The blouse is one of those so easy to make peasant style ones with the elastic casing at the neck. Catherine has a blouse like it that I used to figure out how to cut Kaelin's out.